Heavy mineral (HM) deposits are the principal source of several industrial minerals, including the main source of titanium feedstock for the titanium dioxide (TiO2) pigments industry, and leucoxene (an alteration product of ilmenite)]. HM are also the principal source of zircon (ZrSiO4) and other heavy minerals produced as co-products, such as sillimanite/kyanite, staurolite, garnet, and monazite [(Ce,La,Nd,Th)PO4, which is sought as a source of rare earth elements as well as thorium reported to be used in thorium-based nuclear power under development in India and elsewhere]. The processes leading to the formation of beach placer deposits begin inland. Source (e.g., igneous and metamorphic) rocks that contain heavy minerals are weathered and eroded, from which the detritus composed of sand, silt, clay and heavy minerals are contributed to fluvial systems. The detritus is transported by streams and rivers to the coast, where it is deposited in a variety of environments, including deltas, the beach face (foreshore), nearshore, barrier islands or dunes, tidal lagoons, as well as the channels and floodplains of streams and rivers in the coastal plain. The sediments are worked by the action of waves, tides, longshore currents, and wind, which are effective mechanisms for sorting the mineral grains based on differences in their size and density, resulting in laminated or lens-shaped packages of sediments several and even up to tens meters thick that are rich in heavy minerals (typically, containing >2% total HMs, but locally deposits can exceed 10 percent). Heavy-mineral deposits can be voluminous. Many bodies of heavy mineral-rich sands are typically about 1 km wide and more than 5 km long and the districts in which they occur can extend for more than ten kilometres, encompassing several individual deposits. Reported thicknesses of economic deposits range up to 45 m. Individual ore deposits typically comprise at least 10 Mt of ore (the total size of the individual sand-silt body), with an overall heavy mineral content of more than 3 percent. Economic deposits of heavy mineral sands include numerous Paleogene, Neogene, and Quaternary deposits and some modern coastal deposits. This study provides descriptive and exploration models of Australia’s Paleogene-Quaternary heavy mineral sand deposits accumulated in coastal environments. 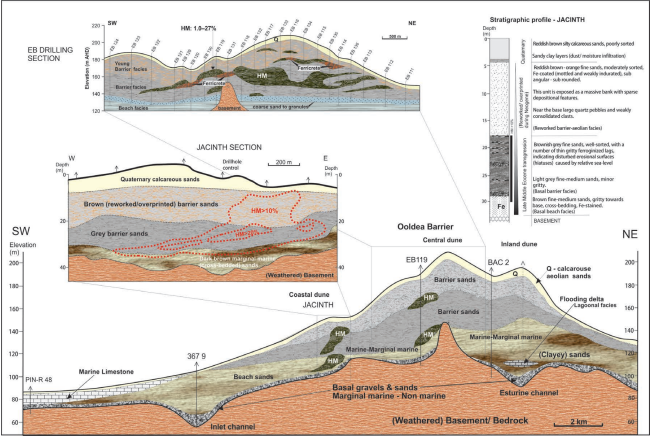 Detailed study of Cainozoic sedimentary basins (e.g., Eucla Basin and Murray Basin, as well as peripheral paleovalleys which drained cratonic provinces (e.g., Gawler Craton) in Australia is important in the exploration for heavy mineral resources. Evidence from sedimentology is combined with that of other geological and geophysical characteristics to arrive at a general reconstruction of basinal and paleovalley architectures and depositional environments. The paleovalleys were originally incised into the pre-Mesozoic and pre-Paleogene landscapes, mostly weathered basement and Palaeozoic and Mesozoic sediments, and became the sites where Tertiary fluvial, lacustrine and estuarine sediments accumulated mostly during the Palaeogene and Neogene. Complicated palaeogeography of the lower paleochannels, including estuaries, determined the sites of HN accumulation. Some heavy mineral sand deposits in the eastern (e.g., Eucla Basin) and western (e.g., Murray Basin) regions have been mined recently on-going research seeks to predict where placer and other deposits, as well as any related bedrock mineralisation, might be located. Regional exploration for heavy mineral deposits can utilize: (1) sediment sampling (analysing for Ti, Hf, rare earth elements, Th, and U); and (2) remote sensing and geophysical surveys. Geophysical anomalies may be small, and surveys are generally more successful when conducted close to sources of interest. The major refinements in remote sensing and geophysical techniques, data processing, sedimentology and computer-aided interpretations are today providing an effective, economic and efficient model for exploring these highly prospective provinces and terrains. The most successful procedure for defining the paleochannels is to combine imagery and geological and geophysical methods to yield architectural and evolutional models of channel development. The study starts with all aspects of heavy mineral deposits and how they are formed. It is followed by data on the mineralogy, petrography, chemistry and ore genesis of HM, and mineralization and exploration methods, as well as remarkable figures and tables, and useful lists of references, include in the publication.